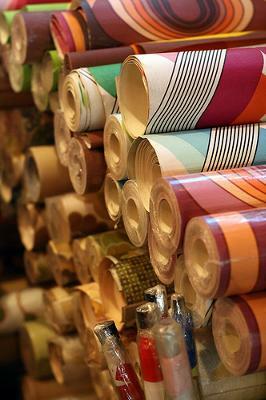 If you want to redecorate a room, you may well decide to go for wallpaper rather than paint. Wallpaper can be very sophisticated, and you can also buy it in a variety of patterns that can really enhance the look of a room. Depending on the attributes of the room, you will find that wallpaper can make a room look larger or smaller, more or less formal, cool or warm. Is the room large or small? If it is a large room, you may want to make it feel smaller and cozier. In this case, you may opt for darker colors as these are known to have a reducing effect. But if it is a small room, consider choosing a light color because these make a room feel larger and airier. If you want the ceiling to look higher, paint it a light color and choose dark-colored wallpaper. Consider the light in the room. If there is not much natural light, do not choose a dark color because it could make the room look very dingy. Do you want patterned wallpaper? If so, once again consider the size of the room. If the pattern is too large, it could make a small room feel overwhelming and crowded, but it could make a big room feel more intimate. Do you want the room to look higher or longer? If you want there to be more of a feeling of height, select vertical striped paper. If your emphasis is on breadth, horizontal stripes are preferable. What color is your furniture? If it is mainly dark, you would do better with lighter paper. But if the furniture is light, you will want darker paper. This is because a contrast looks more tasteful and is not too overwhelming. Do you like floral designs? If so, you will find a great selection of wallpaper that will satisfy your desires. Floral wallpaper comes in many different colors that will suit your taste and your furniture. Remember, when it comes to specific colors, that every color tells a story. If you live in a cold climate or you want to warm up your kitchen, for example, choose warm colors like orange, red, yellow, or brown. But if you want a room to feel cool because you live in a warm country or because you want a more relaxing, calm feeling, such as in your bedroom or bathroom, cool colors are better for you. These include blue, green, white, or aqua. The color of your wallpaper is as individual as the room itself. But once you have made your choice, it will make your task a lot easier.